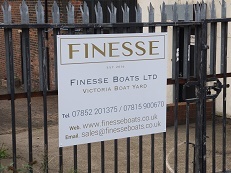 This weekend both Finesse and Tyler Wilson were having open days where people could have a good look around at the current boats on build and talk to all the people that mattered. We headed over towards the end of the day on Saturday and there were quite a few visitors milling around the yard. 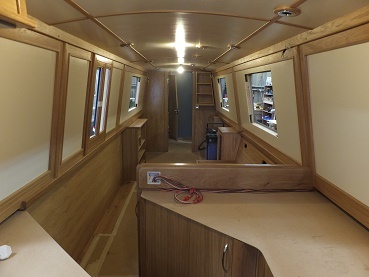 Finesse now have a container fitted out in a similar style to a narrowboat for their office. Oleanna had her dust sheet removed and had had a bit of a clean down before the open day. 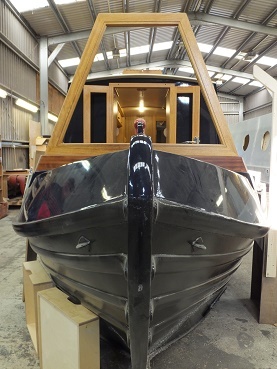 Apart from a couple of finished boats she was the nearest one to completion that Finesse had worked on. A spurt over the last week meant that various things had happened. 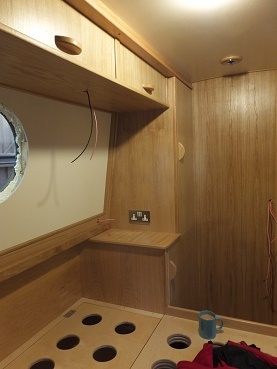 Most of the light fittings were up and the oak trim covering board joins were in position. Light switches and sockets in the most were also on. The spice and herb racks had been made, nice and simple, hopefully enough room for all my jars. Underneath is space for our knife block and the piece of timber with the hole cut in it is for a double socket. Above the cooker was an extract fan. We hadn’t been expecting this, but Julia was insistent that every boat should have one. The amount of condensation you create by just cooking some pasta warrants one. 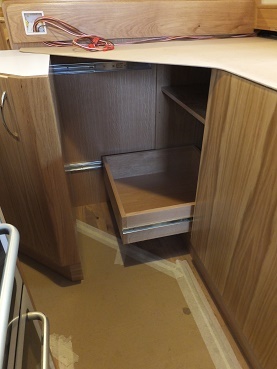 Behind the pull out triangular cupboard a drawer at the bottom had been installed. This means that anything stashed away in the bottom back corner will be reachable. 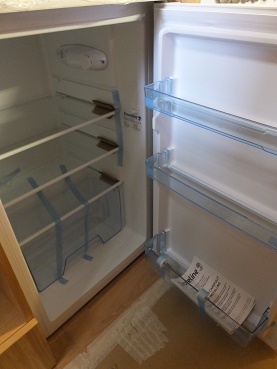 We overheard one lady being shown around saying, “There’s no freezer compartment!” That’s right. At times our current fridge isn’t quite big enough for the fresh food that we buy, so we have dispensed with the icebox at the top. On our current boat the icebox only manages a pack of frozen peas and some ice cubes, so is a waste of space. 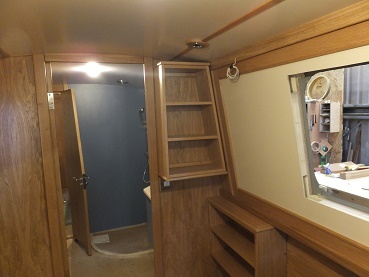 The lady was shown the pull out freezer under the dinette. 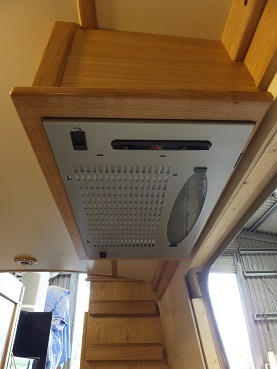 The bulkhead shelf unit was in position. The top shelf should be deep enough for me to have a bowl of bread dough rising up there when the stove is lit. 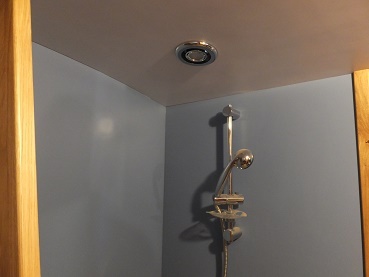 The bathroom ceiling laminate was up. This had been waiting for the cabling to the solar panels to be put in place. 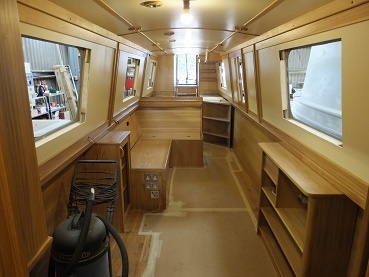 The colour of the laminate was matched as close as we could by the paint on the cream panels in the rest of the boat. 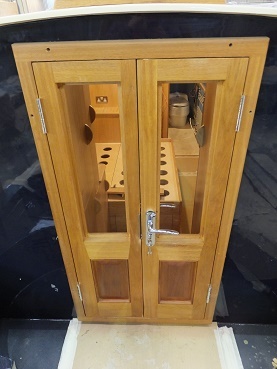 Wooden handles had been added to all the bedroom cupboards. The base of the bed was also complete. 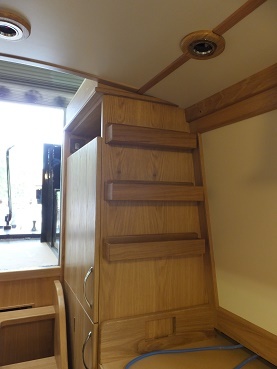 The rear section is hinged to access the area behind the two drawers. This area will be for deep storage, such as winter clothes in the summer. The cratch board was in position, but not the horizontal as this would have been bumped into by visitors. The front doors were also in position. Kim who is doing the upholstery arrived with the fabrics that had been ordered for the curtains. Sadly only samples that were no longer needed had arrived so we weren’t able to choose a fabric for bungs in the bathroom. A discussion regarding how the dinette cushions will work and how high they should sit. 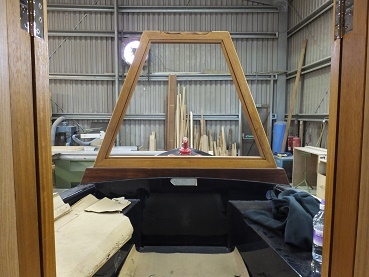 The consensus was in line with the gunnel so as not to cover any of the wood work. We had hoped to be able to get everyone together to discuss various things, but with the number of visitors this wasn’t going to be possible. So snatched conversations were had with everyone. Ricky had got together various samples for the worktops. 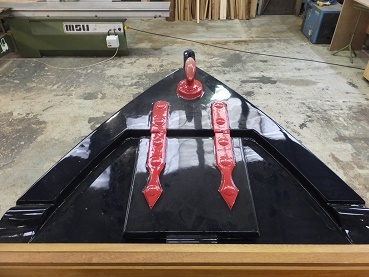 The granite we had been wanting is only available in 30mm, which is too heavy to have at gunnel height, it would affect how the boat handles. So we need to have another look for worktops that are available in 20mm and made from an engineered stone as this is less fragile. A few more questions regarding the batteries still need to be answered. Ken will get back to us next week with the information required and final prices as without knowing the cost we can’t make the final decision. The launch was chatted about and Julia is going to get in touch with Tucky to see where might be suitable places south of Manchester north of Stone for this to happen. Even though it was a busy open day for them all it had been well worth the trip.